So, by now you’ve placed your order for a new Lamborghini Aventador S, right? Well, to fill the Sant’Agata-shaped void in your life until your V12 supercar arrives in the Spring, you’ll be wanting to get your hands on iXoost’s latest audio system. 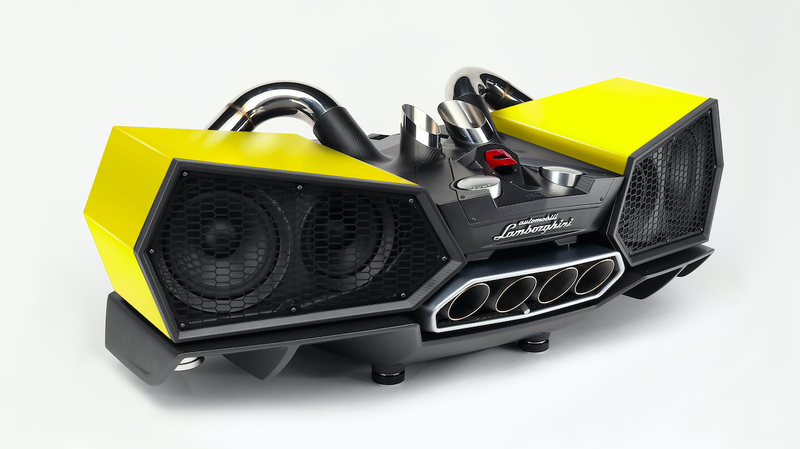 Famed for their speakers incorporating genuine exhaust systems, the Italian Hi-Fi makers’ latest creation – the EsaVox – proudly wears the Automobili Lamborghini insignia on its genuine carbon fibre ‘chassis’. Inspired by Lamborghini’s latest crop of sharp-lined supercars, the iXoost EsaVox stereo system features a plethora of speakers and subwoofers (including a pair of one-inch tweeters hidden inside the genuine quad tailpipes) combining to pump out 800W of pure audio power. Hooking up to this incredible system couldn’t be easier, with both a traditional AUX cable input and the latest Bluetooth 4.0 wireless connection allowing you to enjoy your favourite tunes straight from your smartphone. Of course, just like the supercars that inspired this eye-catching unit, iXoost’s EsaVox doesn’t come cheap. The price tag is an eye-watering €19,900 plus VAT. But, if you really do have an Aventador S on order, then this may just be the perfect accessory.